Neural impulses flash through our brains at up to 120 meters per second. You’re used to thinking fast. And the time it takes to go from decision to action can make all the difference. We believe software should help you work at the speed of thought – not hold you back. We’re taking the possibilities further, creating software that works the way you want to. Making automation smarter through machine learning. Giving you tools that free up time and resources. Cutting out repetitive tasks to enable more effective use of your clinical time. Together we are on a journey to optimal patient care, supported by resources that are as intuitive as they are efficient and powerful. You think it, we’ll enable it. RayStation provides you with fast and user-friendly tools to efficiently and accurately contour the patient in the treatment planning process. It includes a comprehensive toolset ranging from manual tools to high-end semi-automatic and fully automatic contouring tools. Discover some of our customers’ favorite tools below. Structure templates allow you to create ROIs with predefined name, type, and color which allows for consistently labeled structure sets according to the clinics’ protocol. Structure templates may also include geometries including density overrides for quick retrieval of support structures. Model-based segmentation (MBS) delineates organs automatically using statistical shape models for different body sites. The adaptation to new image data utilizes a combination of greyscale gradients and shape statistics. 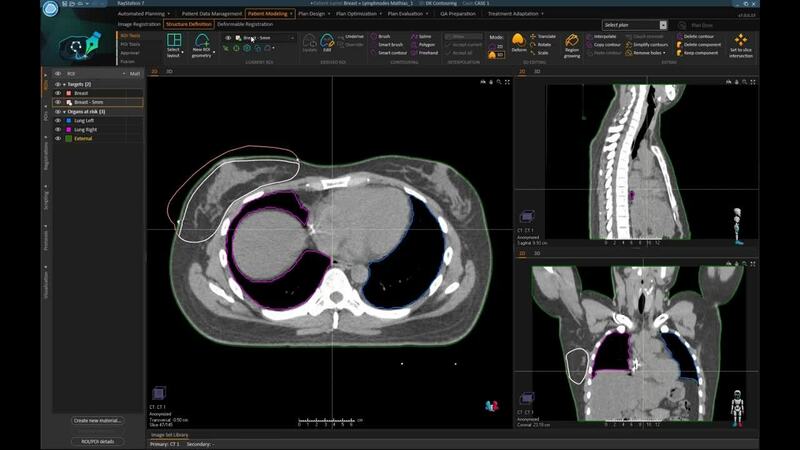 Multi-atlas-based segmentation (MABS) lets you use multiple atlas templates to automatically contour the patient. It’s fast and easy to build your own atlas templates with both anatomical and derived structures. In addition, multiple atlases can be fused for increased accuracy. RayStation uses in-house deformable registration algorithms to propagate contours from multiple datasets to the anatomy you wish to contour. Advanced automation makes the process fast, simple and accurate. Existing data from the clinic database is used to create templates with multiple image sets – atlases. The geometries contained in each atlas can be manually contoured or generated with MBS. New image data is segmented by locating the best-matching atlases through rigid image registration. For all matching atlases, a deformable registration is computed and the structures are deformed onto the new image set. Segmentation results are merged to one result using a fusion algorithm. If MBS regions of interest are available in the template, they may be automatically adapted. 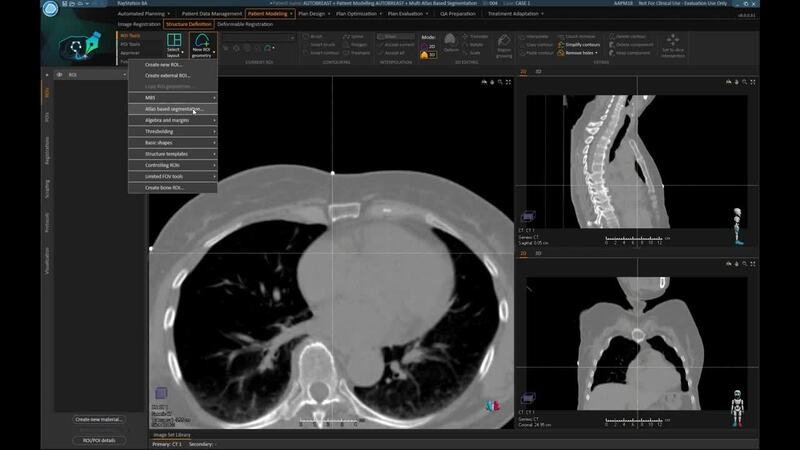 Auto-segmentation of organs at risk in RayStation is set to improve with the upcoming introduction of deep learning segmentation*. The algorithm uses models that have been trained and evaluated on clinical data for different body sites. The GPU-powered algorithm is fast and produces consistently excellent segmentation results. Register for the upcoming webinar to learn more. Huge efficiency gains are possible through automating standard procedures, for example through scripting, protocols and templates. RayStation makes it easy. Automated breast planning in RayStation is a powerful solution that has been shown to boost efficiency, standardization and plan quality, as well as supporting faster adoption of IMRT. Automated treatment planning in RayStation uses the power of machine learning to save planning time and increase plan consistency. The method has been developed together with Princess Margaret Cancer Centre and comes with pre-trained models as well as with the possibility for clinics to train their own machine learning models for planning. Consistency: RayStation’s smart automation delivers measurable clinical benefits. A key one is improved plan consistency; even where experience levels vary, centers can achieve consistent high quality and minimize variations. See the example for automated breast planning. Speed and Quality: Automation makes it possible to increase plan quality while shortening time to treatment. Plan quality has been shown to increase with higher speed. 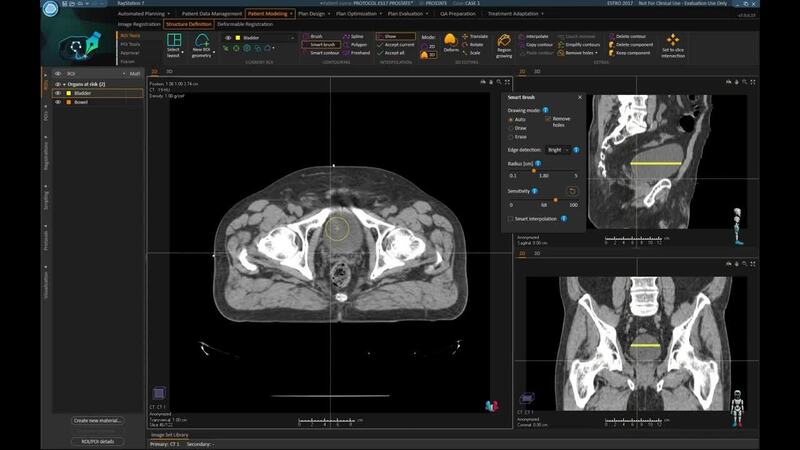 RayCare enables automated active workflows across the oncology disciplines. These can be tailored to your protocols to ensure high consistency and quality. RayCare workflows are designed to be highly configurable, and can be customized to the needs of each center. With active workflows, tasks for specific staff members can be created automatically, triggered by defined events. By continually monitoring the status of the workflow, RayCare will know the moment a task is completed and actively select the next step in the process without any further user interaction. For example, an action such as uploading an image can be set to automatically create a task for a doctor to review the image. The system will thus ensure that actions are always taken in the correct order according to the clinic’s protocols. RayCare and RayStation are designed to work seamlessly together, supporting a smooth and cohesive planning, treatment and ongoing care experience. RayCare’s scheduling capabilities allows resources to be used more efficiently. The advanced rule-based scheduling engine makes it easy to select the first and best available timeslots for any appointment. RayCare is designed to provide total control over treatment scheduling and use of resources. It will ensure the optimal allocation of treatment machines and clinical personnel, accounting for treatment needs, clinical staff schedules and other key parameters. Should resources become unavailable, advanced rescheduling functionality enables batch rescheduling for efficiency. RayCare supports smooth and continuous communication between clinical staff in the RT department. Using RayCare in combination with RayStation reduces the number manual steps, for example in managing images and documentation, and saves valuable clinical time. The workflow is perfectly matched to the clinic’s approach and protocols.